Here at PoolDawg, we're about more than just selling pool cues and billiards supplies. We want to help you take your game to the next level. That's why we created the PoolDawg Academy. The PoolDawg Academy brings together some of the world's best pool players and billiards instructors to give you hundreds of training articles and videos absolutely free. Master level billiards instructors like Tom Simpson and Samm Diep cover the basics and fundamentals; while WPBA pros Jennifer Barretta, Liz Ford and Emily Duddy talk about the mental game, tournament preparation and much more. The Academy is just another reason why PoolDawg is the pool player's best friend. New articles and videos are posted every week. Sign up for our mailing list and follow us on Facebook for weekly training updates! Quiz: How Would YOU Play These Shots? Should I Use a Low Deflection (Squirt) Shaft? 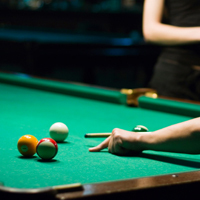 What Kind of Wood Is In Your Pool Cue? How Much Space Do I Need For My Pool Table?